A vibrant ensemble of Peruvian custom, this traditional retablo is transformed into an exceptional picture frame by Alejandro Chávez. 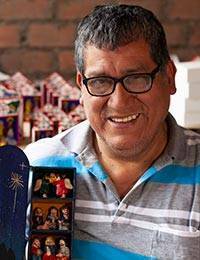 Retablos originally featured religious passages and now Chavez uses this art form to showcase Peruvian traditions as in the lower panel he recreates the colorful revelry of an Andean feast. The side panels flanking the photograph depict quotidian scenes and the upper panel stages the collection of the tuna, a fruit of enticing flavor that grows on cactus. Chavez handcrafts this piece from wood and fills it with myriad personages well defined and detailed.